"He fights like a washerwoman. He fights like a sissy." Unless you're Canadian, journeyman heavyweight George Chuvalo's 1966 bout with Muhammad Ali is unlikely to crack your list of The Greatest's most important or memorable fights; Chuvalo doesn't belong on the short list with Sonny Liston, Joe Frazier, and George Foreman. But in many respects this story of a young man rising from the mean streets of Toronto may be the rule, and Ali the exception; Chuvalo could have had class, he could have been a contender. Instead he's got a fighter's nose, some great and brutal memories, a scrapbook of his fifteen minutes, and a place in the history books, if only as an asterisk. 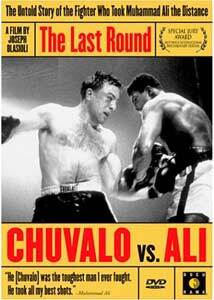 This documentary, produced north of the border, seeks to elevate Chuvalo's story to the level of Ali's, and that doesn't quite work�this isn't When We Were Kings�but it's a pretty fair film nonetheless, about an age in the annals of the sweet science that's never going to come again. Some of the narration is a bit overwrought (e.g., on the boxers: "This fight marked a turning point in both of their lives"), and Chuvalo doesn't have the depth of character or outsized tragedy of Terry Malloy or Jake La Motta. His story is, more than anything else, the odd product of the collision of some unpredictable historical circumstances, almost all of which have to do with his most famous opponent. This is Ali in transition�shedding the name Cassius Clay for Muhammad Ali, bucking the Louisville syndicate that sought to groom his career, taking a principled stance against the war in Vietnam, leading to him being stripped of his heavyweight title. Ali is such a beloved figure in the popular imagination these days that it can be easy to forget how reviled he was at the time�so much so that no United States city wanted to host an Ali fight, and much of white America refused even to acknowledge that Ali had changed his name. Even Montreal wouldn't have him, for fear of boycotts of their upcoming World's Fair; so Toronto seemed like the only available alternative. The folks at Maple Leaf Gardens had to fill up the seats, so the best willing challenger was Chuvalo, nearly a journeyman fighter whose career was something of a series of might have beens. Chuvalo is interviewed, as is Angelo Dundee, Ali's trainer; and a galaxy of sports journalists, including Robert Lipsyte, Jimmy Breslin, and Bert Sugar. Chuvalo's camp was real mom-and-pop stuff compared to Ali's�the Canadian was managed by Irv Ungerman the chicken man, as Ali received counsel from Malcolm X and Elijah Muhammad. Their 1966 bout, according to the film, fixed Chuvalo in the Canadian popular imagination forever�he's not the Canadian Rocky Marciano, but he wasn't merely Ali's punching bag, either, some sorry heavyweight with a glass jaw who hit the canvas after a couple of rounds. He demonstrated that most Hemingwayesque of qualities, grace under pressure; and even if he never quite grabbed the brass ring (as Sugar says of Chuvalo, "Some people are defined by losses"), this affectionate film about him and his moment in the sun is worth a look. Image Transfer Review: A pretty clean transfer, with the sort of raggedy look you'd expect with many of the archival clips. Contrast is a little high, but not too distracting. Audio Transfer Review: A little too much hiss and room tone, but nothing to come to blows over. Extras Review: Brief bios are for the film's producer, director and writer; that and a dozen trailers with the Docurama catalog is all you'll find here. The case for Chuvalo as a boxing legend is more than a little overstated, but this is a smart and affectionate film about a time when boxing wasn't in such a sorry state; there's no shame in Chuvalo never quite emerging from Ali's shadow, for he's surely not the only one.